Express Sign & Graphics started in 1989 in a small 1,000 square foot shop in Chelmsford center producing banners and smaller signs. In 2000, the company was purchased by Nick & Ann Durso and has since grown from a small 2 employee company to 5 full-time employees. We remain a family owned business and our proud of our work throughout New England and beyond. The need for great custom signs, tradeshow signs and booths and vehicle lettering is always growing. To accommodate our client’s varied needs and many projects, we have a wide format printer, vinyl cutters, laser printing and lots of other equipment to get their projects done on time and on budget. We service all types of business and organizations by providing quality custom signs and vehicle lettering. Our work takes us throughout the area including NH, VT, ME, CT, RI, and MA and occasionally across the country. Many of our clients are new businesses and organizations and many are repeat customers that we have worked with for many years. We are a full-service design-build-install sign company and work with architects, general contractors, non-profits, for-profits, franchises and many others to produce quality custom signs for virtually any need. We look forward to meeting you and helping you make your sign project as Easy as 1-2-3! 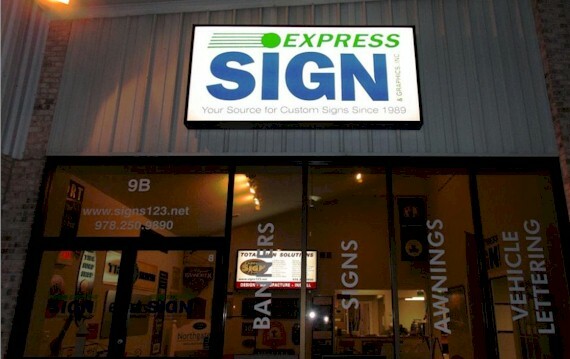 Express Sign & Graphics, Inc. has been designing, fabricating and installing all types of custom signs since 1989. Whether you order vinyl decals or a multi-sign exterior project, you will find that we put the same care and quality into every customer’s order. Our fabrication team has an incredible amount of flexibility and can assist you with custom sign projects for 1 to 10,000 signs. Our knowledge comes from our experience which we put to work for our clients every day. We offer an extensive line of sign products to help our clients advertise, inform, and direct including all types of custom interior and exterior signs, banners, banner stands, trade show products, truck lettering, safety signs, project site signs, custom dimensional signs, awnings, and so much more. Several years ago we made the decision to move from our small retail space to a larger shop that would allow us to have a great showroom to showcase our products, a large fabrication area, offices and a heated garage for vehicle lettering. We have a great showroom and office space to work with our clients. We have the latest software, computer equipment and sign manufacturing equipment to allow us to turn your project around quickly and efficiently. Our newly redesigned website was developed to act as an online showroom to help our customers better understand our product offerings and how we can help them. Our staff members are all knowledgeable in all of our products and they are all ready to help you. 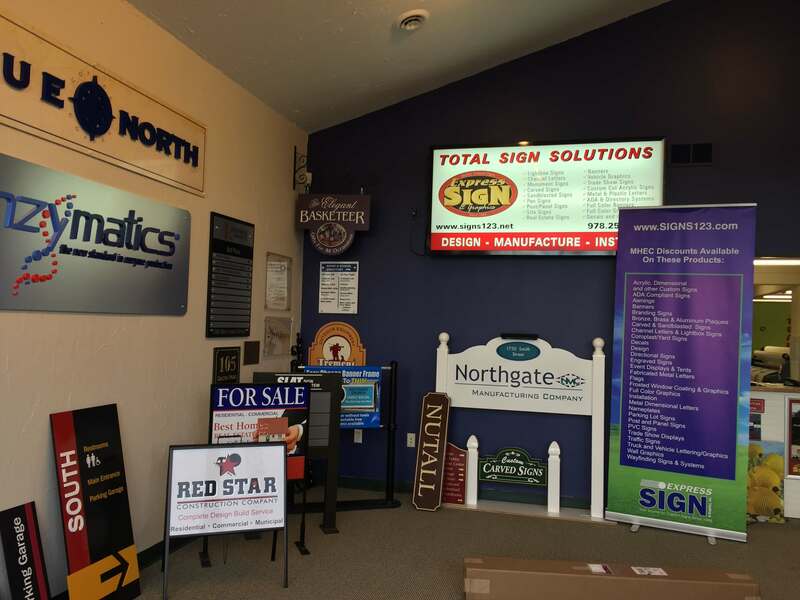 Our showroom is full of examples of carved signs, political signs, sign frames and stands, lighted signs, custom signs and tradeshow products so that you can see your options before purchasing. Our staff has grown along with our experience and we handle projects all over New England for prestigious organizations and companies as well as small businesses, non-profits, and even clients purchasing personal items and gifts. We have the knowledge to help you with your next project, large or small. For more information on our staff, visit our Team Page.